The BBC has released more details on the return of Tom Baker to the role of the fourth Doctor after twenty eight years. Baker reprises his role in a new five part audio adventure for BBC Audiobooks. 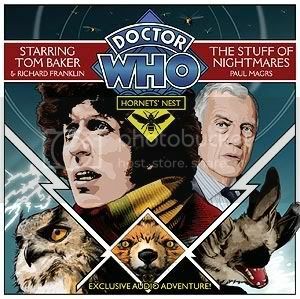 Doctor Who: Hornets' Nest, is written by Paul Magrs and also stars Richard Franklin as Mike Yates, Susan Jameson as Mrs Wibbsey, Rula Lenska as the Hornet Queen and Stephen Thorne. The first story, The Stuff of Nightmares, will be available to buy from 3rd September 2009 with the remaining four stories following in subsequent months. To support the series a dedicated webpage will launch on 10th August. 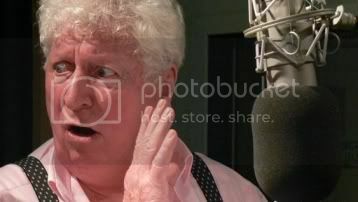 The page will contain exclusive content and material such as a Q&A with Tom Baker, photographs from the recordings, audio clips and a poll on Tom’s best moments as the Doctor. Responding to an advert apparently worded for him alone, Captain Mike Yates (retired) is reunited with a ghost from the past. But why has the Doctor, that mysterious traveller in Time and Space, sent for his former UNIT acquaintance? Trapped by a horde of vicious creatures in an apparently innocuous English country cottage, the two old friends are on the brink of an enormous adventure. As the Doctor relates his recent escapades, it becomes clear to Mike that they – and the Earth at large – are facing an enemy of unimaginable power and horrific intent. The nightmare is only just beginning. Welcome to the Doctor Who News Page's New Home!